10 Best Cross-Country Skiing Trails in Montana! When Big Sky country is blanketed in white, it’s all about cross-country skiing. 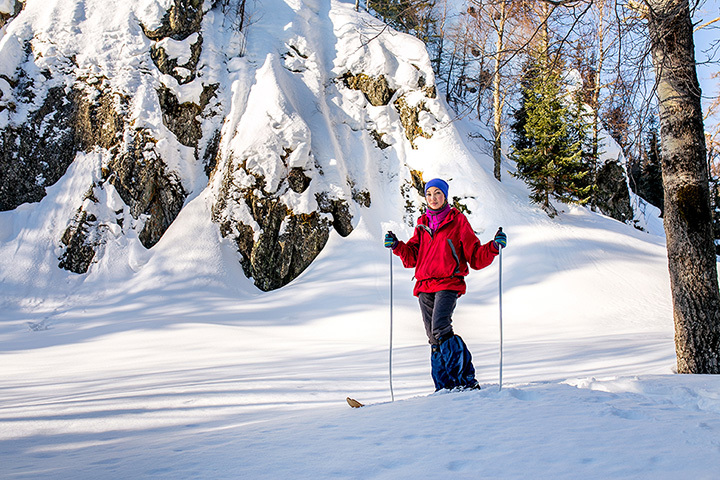 No matter your skill level, the plethora of Nordic centers and resorts of all sizes makes locating a trail network a cinch. Here are 10 beautiful places to traverse through scenic Montana on a pair of skis. Come December, the trails in and around Glacier National Park crawl with cross-country enthusiasts. With summer and fall tourists long gone, many roadways fill with snow and become impassable for vehicles. But they’re perfect for skinny skis. The scenery is unmatched, the chance for wildlife interaction is decent, and with snow machines banned in the park, the quiet of the wild is almost deafening. Though skiing is free, a park pass is required, and can be purchased at any of the park entrances. If you prefer to stay in town, just outside Whitefish, the Glacier Nordic Center encompasses 12 kilometers of smooth, rolling trails. In need of rentals, lessons or are interested in a guided trip of the park? Stop by the Glacier Cyclery & Nordic Shop on site. Just near the Idaho/Montana border and adjacent to Lost Trail ski area, the network of trails at Chief Joseph Pass are just an hour’s drive south from Hamilton. There’re no lights for night trekking, but the routes offer bucolic Bitterroot pow 24 hours a day. Open December through April, access is free to the public. Trail maintenance is funded via membership fees to the Bitterroot Cross-Country Ski Club, and it isn’t required, c’mon, donate a few dollars to the trail crews ($15 per year, $25 per family). Just near the trailhead is the Gordon Reese Cabin to warm up before or after a trek, and overnight reservations can be made online. Two miles west of Red Lodge lay the only groomed cross country trails in the region. Families and regulars enjoy the 15-kilometer network for its great snow and backdrop of rugged Montanan wilderness. Those favoring a more strenuous workout can take-up skate skiing, a cousin to cross-country that keeps touring skiers in shape during the off season. Private or group lessons are available as well from trained and certified instructors (reserve online). But, come prepared, as this bare bones arena lacks rentals or amenities, save for a lone porta-potty. Outside of Great Falls, the recreation area around King’s Hill and Silver Crest shares in the beauty of nearby Showdown Montana ski area. This network of trails nestled in the Little Belt Mountains is fee-free and open all year. Though amenities are limited outside of the nearest town of Neihart, restrooms are on site and snowshoes and equipment are available for rent. A partnership between Silver Crest and King’s Hill keeps trails nicely groomed late November through April. If you’re tuckered out and want to stay trail-side, reserve the King’s Hill Cabin, with a capacity for six winter travelers, for $40 per night. Only 16 miles from cosmopolitan Bozeman, this ski center established in 1987 rests in the serene Bridger Mountain Range. Impeccably groomed, the 30 kilometers of trails remain open all winter, weaving through scenic and secluded sections of wilderness, wherein interactions with wildlife are common. On-site lessons are available for all skill levels, with clinics offered for more intensive, personalized instruction. And for $20 per person, the Nordic Adventure Program instructs students not only in cross country mechanics and manners, but also in environmental appreciation and conservation. The center hosts a Ski Shop, with rentals of all types available, be you skier, snowshoer or skater. The Izzak Walton Inn is the idyllic Montana scene: serene and relaxing, framed by snowcapped peaks and bordering Glacier National Park. It provides an all-inclusive experience, with lodging, dining and winter activities abound. Only an hour from Glacier International Airport, the property sports 30 kilometers of trails, with varied terrain to accommodate all skill levels. If your gear is forgotten, lost, or in disrepair, boots, poles and skis are available for rent at around $30 per day. Replenish your calories at the Dining Car restaurant for breakfast, lunch and dinner, and spend the night in a luxurious lodge room, family cabin, or renovated train caboose. Flathead Lake is beautiful no matter the time of year. But skiing on Blacktail Mountain’s 25 kilometers of trails is hard to beat. Eight miles above the town of Lakeside, this network is free to the public and funded entirely by personal and business donations. The trails are well-maintained and smooth, groomed daily December-March by the North Shore Nordic Club (which also manages trails across the lake, in nearby Bigfork). Dogs are welcome, so bring your best friend, your favorite skis and hit Blacktail Mountain. For those near Whitefish Mountain Resort seeking more advanced and expert terrain, Big Mountain is ideal. Another project of the Glacier Nordic Club, the challenging, but fun, experience is described as “a lot of down, around and up!” The 12-kilometer trail network merges with resort property, allowing for a diversity of topography, and offers all the amenities: repairs and rentals, customizable group and private lessons, and restaurants and lodging. The Georgetown Lake Area is extremely scenic, wedged between Philipsburg to the north, and Anaconda to the east. At the convergence of three mountain ranges (6,425-foot elevation) the Mount Hagan Wildlife Management Area encompasses 25 miles of trail. Maintained by the Echo Lake Trails Association, routes are easily accessed from parking lots at Discovery Resort. Skiers have their pick of difficulty, given the diverse terrain of Georgetown Lake. And they’ve also their choice of amenities at nearby Discovery Resort, be them rental, retail or restaurant. There’s no fee for trail access, but rentals will run $15 per day. Named Cross Country Skier Magazine’s No. 1 Nordic resort in North America, Lone Mountain Ranch has over 85 kilometers of beautifully-groomed trails. Once a homestead at the turn of the last century, the lodge and saloon were recently renovated to bring a rustic modernity to the frontier vibe of the area— “The Real Montana.” Not only is the property impeccable and full of amenities, the proximity to Big Sky Resort means full access to rentals, repairs and choice of lodging and food. After a day of cross country, reserve a sleigh ride or dine on some authentic mountain cuisine. View more Montana Cross Country Skiing Trails.